This is our number one most popular sharpener! We have even had customers buy then by the box; to give away as gifts. The glass jar has about a 1 oz capacity. 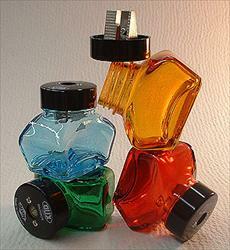 The lids are sturdy, heavy duty plastic with a solid aluminum sharpener bolted on. Functional and beautiful, these are molded to look like ink wells from the turn of the century. Available in three bright colors! Amber is no longer available.